St. Canice’s was opened in 1889. The architect was John Bede Barlow. 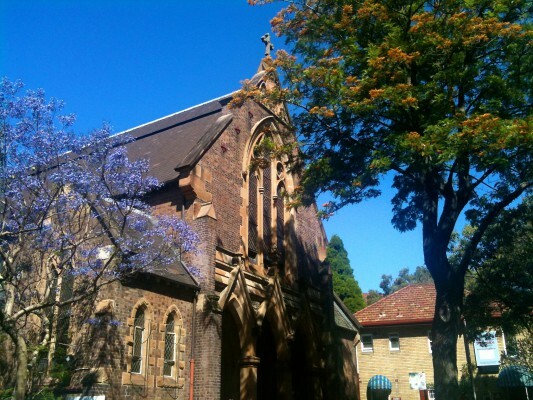 Other churches of Barlow include those in Marrickville, Paddington and Rose Bay. St. Canice was an early Irish monk and it is likely that the name was chosen by Cardinal Moran, the first Irish Archbishop of Sydney. 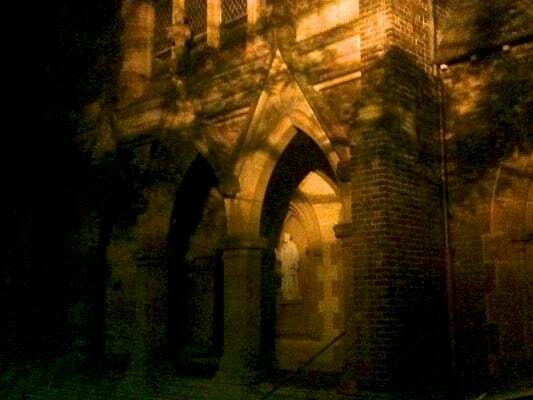 At the beginning it served as a chapel of ease for the parish of Darlinghurst. Later it was serviced from St. Mary’s Cathedral. In 1940 a presbytery was built and resident priests were provided for the church. Even then it did not become the centre of an ordinary parish, being controlled by an administrator until very recent times. The Jesuits arrived in the parish in 1990. St Canice’s early history coincided with ‘the Irish Phase’ of our Sydney Catholic story – which began in September 1884 when the man who would become our first Cardinal, the Irish Patrick Moran, reached the city. Moran was very much the diocesan Priest. There is good reason to think that Moran may have contemplated the building of our church very soon after he came to Sydney. Within a few weeks of his arrival he took a party of Sydney laymen to Manly by boat, to show them land where he planned to build a residence and an expensive seminary. Our founding father, John Hughes, was in that group, and it is possible that the idea of buying the land for St Canice may have grown out of this early meeting. 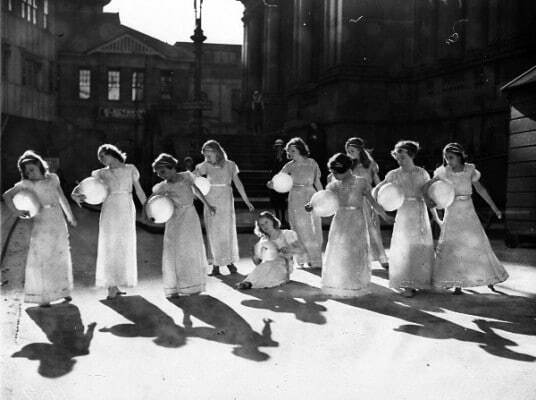 This was a time of population growth in Sydney. Its population, had trebled between 1870 and 1891, and by the 1880s would have been approaching the 400,000 mark. In May 1885, Moran was summoned back to Rome, where he was made a Cardinal – Australia’s first. While Moran was overseas the land for St Canice’s was bought by John Hughes, and he presented it to the church. In what is said to have been his last piece of serious business, paid the princely £3,500 for our land here. But, sadly, in that time he also died, and was not there to greet the new Cardinal on his return. After John Hughes death in 1885, his wife, Susan decided to proceed with the church in Roslyn Street, and pay half its building costs, as a memorial to her husband. In a move that turned out to be inspired, she also proposed a family relative, John Bede Barlow, as a suitable architect for the new church. Barlow was a nephew, but also a friend. He was a working architect in Sydney, but still only in his twenties, and was yet to make his mark in his profession. One remarkable thing about the church Barlow planned, and which we are in at this moment, is that it stands today almost exactly as it was when it opened. It is ‘historic’ in that special sense, that we see it now as it was then – even more so after the sensitive restoration work done by Father Steve over recent years. The name, ‘Saint Canice’, was given to our church in a very personal decision by Patrick Francis Moran, Australia’s first Cardinal. He was totally devoted to the man, and even wrote a little book about him. After St Canice became a parish in 1940 a new school building was constructed – the present Jesuit Refugee Service (JRS) office and Canice’s Kitchen – and numbers in the school became higher. The school choir will broadcast the benediction on next Sunday evening from the parish church over the national station, 2BL, at 7.15 pm. An interview with the last principal of the school confirmed that Roslyn street was a place where standards were reasonably good, and which, at times, had been innovative – introducing open-plan teaching when it was first becoming popular, for example. We know that there was always a good choir at St Canice. And its tuck-shop by the door into the annexe in our present-day car park usually worked extremely well. 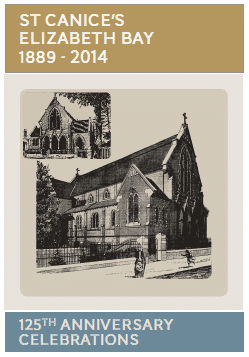 2014 is the 125th Anniversary of the opening of St Canice’s. You might like to read an article from the Sydney Morning Herald of Monday May 6, 1889. Click here. 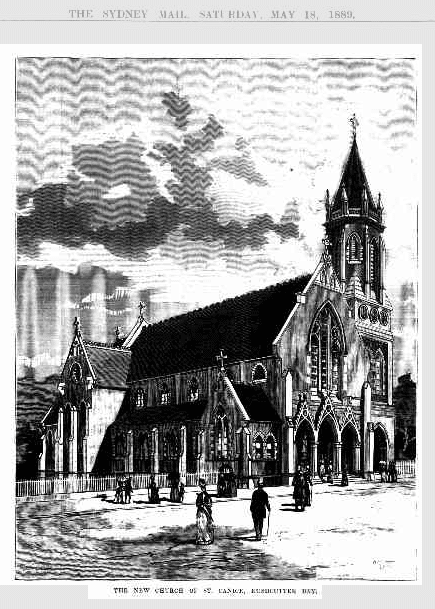 Drawing of St Canice’s as built – May 1889. Drawing of St Canice’s with the Spire that was never erected.